Turkish developer Sedesco is putting together a Billionaires’ Row assemblage with the purchase of a development site for $80 million. 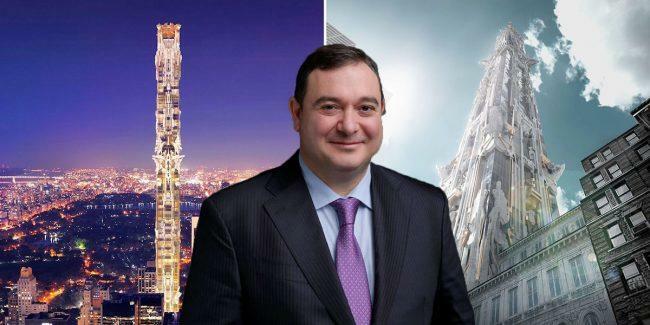 Sedesco closed last week on its purchase of the property at 41 West 57th Street from Florida-based seller Asuman Polat, property records filed with the city Tuesday show. The purchase gives Midtown-based Sedesco about 100,000 square feet of buildable area on the block between Fifth and Sixth avenues. The company in 2012 paid $71.5 million to buy an adjacent property at 50 West 58th Street. Renderings for an ornate, 102-story residential tower at the site appeared online in 2015, though they appear to be merely conceptual. Good news. Hopefully another supertall. It would be great if Sedesco could acquire that ugly next-door apartment building. It would be nice if something very tall and striking rises here, as opposed to a “So Low” black box. So these are the properties for this tower? No. 41 and 43 W 57th do not include the building with the green copper roof. The parcels form a nearly perfect rectangle running from 57th to 58th. No. On 57th, the developer owns 41 and 43. 43 is the one on the map with the blue dot that says Crustiani. This is what they look like at street level. Sedesco, a subsidiary of an Istanbul-based firm, filed demolition permits for a pair of buildings along West 57th Street last week, according to city documents. Along with an adjacent building to the north, the company appears to be prepping the through-block site for a new project. The Turkish developer has spent about $223 million buying out a ground lease and purchasing the three properties for the assemblage. Together the sites could generate a 100,000-square-foot project, according to a Real Deal report. The Department of Buildings said it is still reviewing the pair of demolition permits for 41 and 43 W. 57th St. It already granted permission to tear down the adjacent building, at 50 W. 58th St. They have a lot more than 100k sf. Article talks about a simple site FAR calculation, which is essentially irrelevant. Care to elaborate? How much FAR do they really have? Is it enough to build a supertall?